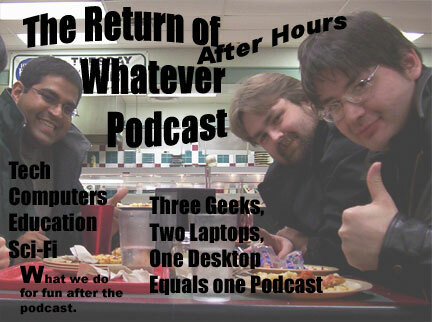 Have you ever wondered what the Return Of Whatever boys talk about after the ROW podcast? Well now you can! Dan and Herb tried out some new podcasting software and recorded this pilot test show. Let us know if you like it. This week Dan tells some stories about Herb when the gamers all went to the movies. If you are a Herb fan, you have to check this cast out!! You'll LOL!!!! If you like the humor of ROW with out the tech, you'll love this podcast! Amit and Herb star in this podcast. This isn't the samurai podcast, but there is a lot of the tech this week! Watch Herb sing the "I'm a Nerd" the cowboy way. A country version of his big hit! Amit and Dan and Herb star in this podcast. The parts are back together to complete the kool-aid. Fun times with the ROW podcast. Happy Father's day!!! This is the samurai podcast, which means there is a lot of samurai fun in with the tech! Over 9 years of events since Duke Nukem Forever was announced. Social Networks: Future Portal Or Fad? Advice to Students by a MAC! Dan and Herb star in this podcast. Fun times with the ROW podcast. One year of Return of Whatever! This is our first anniversary! Amit, Dan and Herb star in this podcast. Thank you all for being loyal listeners. Apple to India: "Nevermind on that whole tech support thing."